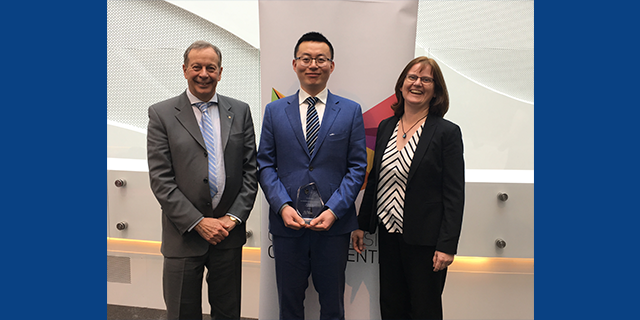 Congratulations to Shuai Li, a PhD candidate from Centre for Epidemiology & Biostatistics, on winning the 2018 Picchi Award for Excellence in Cancer Research in the field of Population Health. 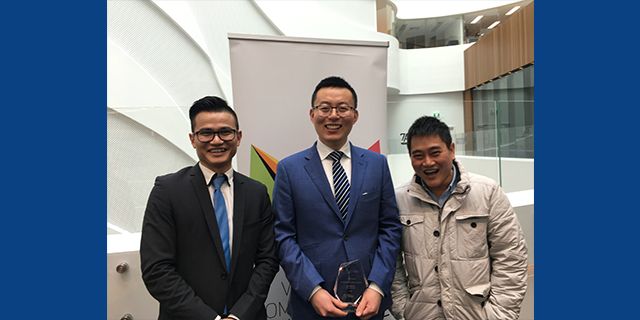 This is another achievement for Shuai following his recent achievement of one-year Cancer Council Victoria Postdoctoral Research Fellowship. The Picchi Award is a prestigious one awarded by the Victorian Comprehensive Cancer Centre (VCCC) and sponsored by the Picchi Brothers Foundation. The winner is selected from the applicants who are PhD candidates in cancer research from different organisations affiliated with VCCC. This year, Shuai is ranked as the top applicant in the field of Population Health and awarded the “Picchi Award” trophy together with a travel grant $10,000 to support his upcoming travel to Cambridge University (UK). The Award presentation ceremony was held on Monday, 9th July at 1-2pm in Lecture Theatre B, Level 7, VCCC Building. Read more about Shuais work here. Shuai is the third Picchi Award Winner from Centre for Epidemiology and Biostatistics following Dr Aung Win, Inaugural 2012 Picchi Award Winner and Dr Kevin Nguyen, 2017 Picchi Award Winner. All three award recipients are pictured below.